Bludit utiliza archivos en formato JSON para almacenar el contenido, no es necesario instalar ni configurar una base de datos. Customize your Bludit powered site with beautiful and cool themes. You can download themes from the official site. Extend Bludit's functionality with amazing plugins. You can download plugins from the official site. Bludit incorporates all the SEO tools to improve your ranking in all the search engines and social networks. 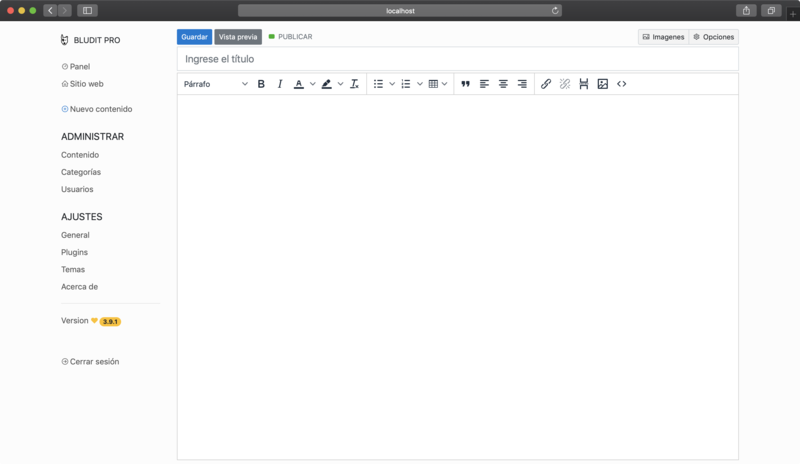 Bludit supports Markdown and HTML code for the content, also provide Markdown Editor and WYSIWYG Editor. Bludit takes care of the security and privacy of the users. Bludit doesn't track or uses any external resources. Read our documentation for requirements, installation guide, how to's and more. Do you need support? Reach us in the forum, chat or Github issues. Bludit © 2015-19. All Rights Reserved.